I LOVE.... HUMMUS!! I really really do. Luckily for me, so does my family. Creamy hummus and some fresh and warm pita bread... yummmm... makes my mouth water. I can eat hummus with anything - Bread, Roti, Naan etc. Sometimes, I cheat on the pita bread with Crackers. I spread the hummus on crackers and savor them at tea time. 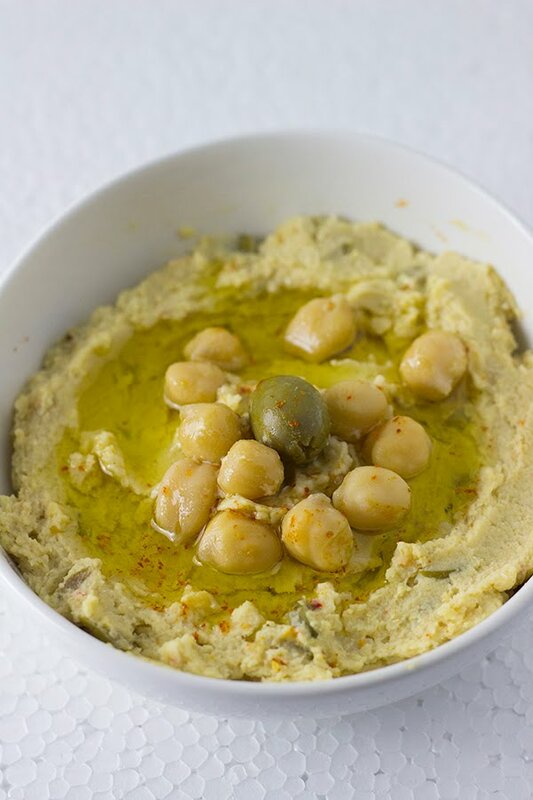 Until recently, hummus was something you could only have in middle eastern restaurants. And even they were so few. But these days you can buy hummus from your super market. May not be at the really local grocery chain but you can definitely get them at the gourmet grocery chains. And you get them in so many flavours these days - roasted pepper, sun dried tomatoes, peri peri, rosemary etc. I'm still a fan of the original Hummus. Recently, however, I picked up one with tiny bits of Olives in it and I simply loved it. 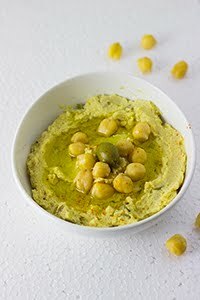 This Olive Hummus has a predominant taste of olives , however, it does not overpower the original hummus. 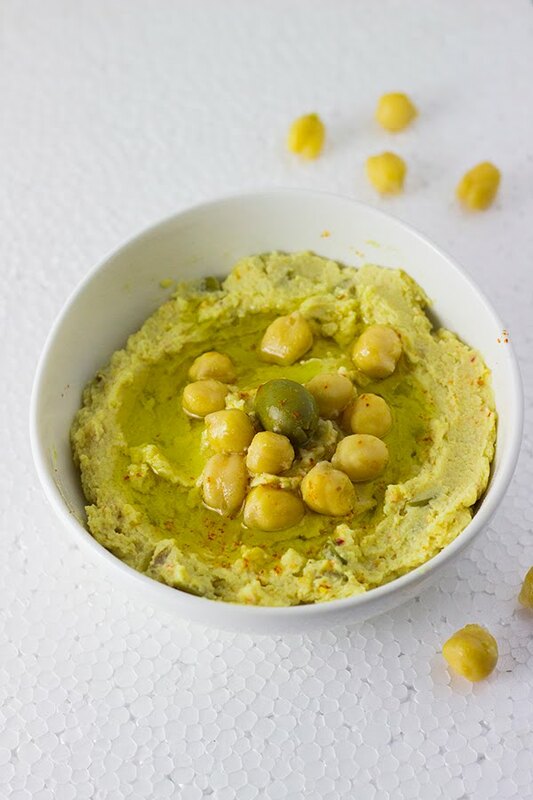 The hummus turns out smoother and creamier if you peel the chickpeas before blending it. But if you are a Lazy bug like me, skip it and blend. Usually Hummus is made with a creamy sesame butter called Tahini. Tahini has a low shelf life and is not available very easily. Don't worry! It can be easily replaced with toasted sesame seed powder. That's what I have done. It adds a nice nuttiness to the Hummus. This time I made my own whole wheat pita bread to enjoy the hummus if. If you thought it is difficult to make, you are totally mistaken. Check out how to make pita bread here. I replaced the all purpose flour with whole wheat flour and it tasted equally amazing. DO NOT throw out the water you cooked the chickpeas in, store it in the fridge and wait for my next post, I'll show you how you can make a simple garlicky broth with it that we call "Kattina Saaru". It is a famous accompaniment to rice across Karnataka. Soak the dried chickpeas overnight or for 8 hours in 2 cups of water. Cook them with salt until they are well done. I pressure cook them, it takes around 10 minutes. Don't worry if you overcook them, that's what we need. Drain them and allow them to cool. Keep the water aside. Peel the chickpeas by gently squeezing them for a smoother hummus. Lightly warm the Sesame seeds in a pan and grind them into a powder. Blend together the chickpeas, sesame powder, garlic,salt,1 Tbsp of lime juice,2 Tbsp of olive oil and around 2 Tbsp of water. Blend well until the hummus is smooth. If the mixture is too sticky for your blender, continue to add 1 Tbsp of water at a time to loosen the mixture. Add the remaining lime juice and Olive oil as per your taste and mix well. Finely chop the olives and add it to the hummus and mix well. I love garlic. The quantity I added makes it really garlicky. Adjust the garlic according to your love for garlic. The garlic pods in India are really very small, so you may want to start off with 1/2 a pod and then continue to add more. Or you can add garlic powder or paste. Start with 1/2 tsp and increase as per your taste.